Captain America, Street Glide Special (Touring). INSPIRED by some of the most powerful and iconic Marvel characters ever to grace a comic book, Harley Davidson and Marvel have revealed 27 custom motorcycles, each one uniquely designed to reflect the personality and traits of a Marvel Super Hero. Just like characters in the Marvel universe, no two customised Harley-Davidson motorcycles are the same; different powers, agilities and looks. The collaboration showcases some of the most popular Marvel characters and Harley Davidson models – a Groot-inspired Street Glide Special from the Touring range, a Thor-inspired Breakout from the Softail family, and a Black Widow-inspired Iron 883 from the Sportster family to highlight just a few. 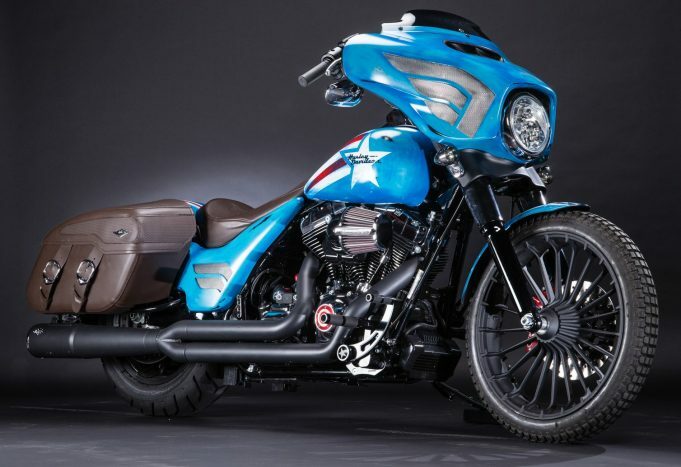 Bikes, including the Captain America custom (pictured) will be on display at dealerships and special events around the country (with the entire collection on show only at Oz Comic Con in Sydney on September 10 and 11). For those keen to check them out in all their glory, here are the bikes, and the locations you can see them.